Dimensions 2.50 by 7.50 by 9.50 in. 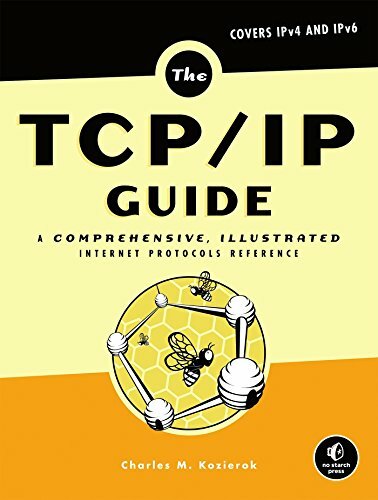 Amazon.com description: Product Description: From Charles M. Kozierok, the creator of the highly regarded www.pcguide.com, comes The TCP/IP Guide. This completely up-to-date, encyclopedic reference on the TCP/IP protocol suite will appeal to newcomers and the seasoned professional alike. Kozierok details the core protocols that make TCP/IP internetworks function and the most important classic TCP/IP applications, integrating IPv6 coverage throughout. Over 350 illustrations and hundreds of tables help to explain the finer points of this complex topic. The bookâs personal, user-friendly writing style lets readers of all levels understand the dozens of protocols and technologies that run the Internet, with full coverage of PPP, ARP, IP, IPv6, IP NAT, IPSec, Mobile IP, ICMP, RIP, BGP, TCP, UDP, DNS, DHCP, SNMP, FTP, SMTP, NNTP, HTTP, Telnet, and much more. The TCP/IP Guide is a must-have addition to the libraries of internetworking students, educators, networking professionals, and those working toward certification. About: A comprehensive guide to TCP/IP that details the core protocols that make TCP/IP internetworks function, defines networking and the OSI model architecture, and covers the dozens of proctocols and technologies that run the Internet.